Triangle have been awarded the contract for the fire fighting systems at 101 George Street on behalf of Tide Construction. We have an excellent working relationship with Tide, having successfully completed other modular buildings for them including Dexion House and Karma House. The residential development comprises two towers at 44 storeys and 38 storeys. The building will be made from 1500 separate modules. The fit out, including fire sprinkler system, will be installed to the modules at a factory in Bedford before being delivered to site. Once on site the module is connected to the power and water supplies, our engineers will then attend site to commission the system. 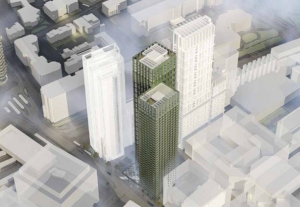 Once complete, the development will be the world’s tallest modular building. Currently the tallest modular building in the world is a 32 storey high rise in New York.